The Teapot on the bottom left edge has a little circle casting pop, speck imperfection, teapot height is 2.75" Saucers are 2.5". Teapot is 1 3/8" wide & 1 1/4" tall. Dollhouse Tea Set. Platter is 2 1/2" x 1 1/8". Maruyama Made in Japan. Antique Dollhouse Miniature 9 Piece Porcelain Tea Set. White with Gold Decoration, Very Pretty Pattern. Condition is very good. Excellent to OK Condition! - White Teapot w/Lid. - 9 White Plates/Saucers. - Blue Plastic Pour Bowl w/Spout and Handle. Handle is chipped on the end. Made in USA. Adorable hand painted Red Flowers and gold trim. 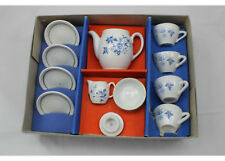 Vintage Dollhouse Miniature Tea Coffee Set White Gold Bone China 10 pc Neutral! Vtg DOLLHOUSE MINIATURES White & Gold Bone China TEA SET Coffee 10 pc. Mint! EUC Hard-to-find very Versatile Fancy Tea/Coffee Set - it goes with any Color scheme! Made of Bone China, marked on the bottom. Tray is approx. 2 1/4" long. Beautiful GOLD TRIM! In excellent condition. There are No chips or cracks. Please see pictures as they are part of the detailed description. Please ask any questions before buying! Thank you!! *************************************************************** I only accept returns if something is different from how it was described, so please bid only after checking things out! Please email me with any questions. Let me know if you need more photos! Payments are PAYPAL ONLY and expected within 3 days of auction ending. If you need more time please email me. 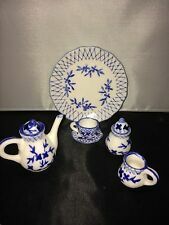 Dollhouse Miniature, Vintage Tea Set, porcelain Blue white gold 6pc Ships Free! Great for playing with dolls or displaying in a dollhouse! Lovey cobalt blue with gold trim. We are happy to answer them! Really pretty set! Condition is New. For an accurate quote, make sure you enter your Zip Code in the Default Zip Code Box. PINK ROSES PATTERN PORCELAIN MINIATURE TEA SET-GOLD TRIM-7 PIECES-VICTORIAN STYLE. 1 nick on edge of saucer. One or Two dots of missing gold paint. A miscellaneous grouping of mini doll house sized plates and tea sets. The ones with the green bow and pink flowers (8 pieces) do not have any makers marks. The rest have Made in Japan written on them. THERE ARE 15 PIECES, ALL IN IN NEAR MINT CONDITION. THE BOX IS MISSING. 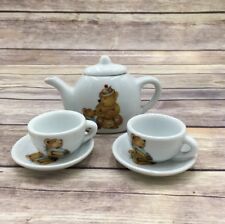 I'M NOT CERTAIN IF THIS IS A COMPLETE SET, IN MY REASERCH, I WAS ABLE TO FIND SEVERAL 14 PIECE BUNNY TEA SETS, BUT ONLY 23 PIECE TEDDY BEAR SETS. Excellent Condition! Pretty Little White Glaze with Red Trim. Each has a little Yellow & Green Building on the front. Each has Red Trim. All of the pieces are in excellent condition, just ready to grace your Dollhouse's table. Wouldn't this teaset make a lovely addition?. Want a second item, too?. Excellent Condition! Pretty Little Doll Daisy Tea Dish Set! Each has Pink & Gray Cherry Blossoms Flowers. Pieces are Stamped with Made in Japan. 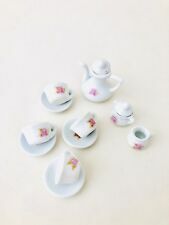 Cute Miniature Doll Tea Set to add to your Collection! An extra lid. Excellent Condition! Made by: Leneige China, Burbank, California U.S.A. Pretty Scalloped Cup. Cup is 1" Tall. Has Been Kept in a Locked Cabinet. From an Estate Where the Owner Collected During the 1940's - 1950's. REAL HEARTS Organization appreciates your HELP & SUPPORT ! R espect E ducate A dvocate L ove Hearts Organization. 2 Vintage Dollhouse Miniature Gold Pitchers China Porcelain Marked Japan 1-5/8"
2 Vintage Dollhouse Miniature Gold Pitchers. They are a white china porcelain covered in gold. One is Marked "Japan" on the bottom in red with a wreath. Both measure about 1-5/8" tall. Shows very little to no signs of use! Please see pics! Please excuse glare and reflections in pics!. One set barbie the other is not but looks nice. small chip on pour spouts, see pics. Vintage California Tea Cup set Dollhouse porcelain white gold 6pc Free S/H! This lot was not originally together. We are happy to answer them! Fun display piece, travel souvenir.